A three-time Olympic gold medal winner, Sonja Henie used the same discipline and determination that made her an ice-skating champion to emerge as one of Hollywood’s top stars of the late 1930s. She was born on April 8, 1912, in Oslo, Norway, where her father, Hans, was a successful fur salesman. Himself a former world bicycle champion, Hans encouraged Sonja and her older brother Leif to excel in athletics. Instructed by Leif, Sonja began skating at eight and won her first competition the next year. Thereafter, the Henie family devoted its time and sizable financial resources to making Sonja a skating star. Owing to the Henies’ help and Sonja’s fierce competitive spirit, she was victorious at the 1928, 1932, and 1936 Olympics as well as winning 10 consecutive world championships. In the process, Henie transformed her sport. Inspired by Russian ballerina Anna Pavlova, she incorporated dance moves into skating routines for the first time. 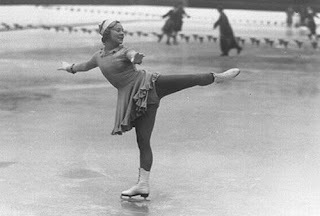 She also introduced rigorous training schedules and close attention to costuming into international skating competitions. 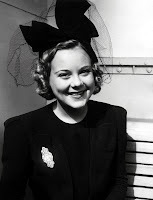 Again with the support of her family, Henie abandoned her amateur status in 1936 to perform in films. “I want to go into pictures, and I want to skate in them,” she announced, adding, “I want to do with skates what Fred Astaire is doing with dancing.” To gain the attention of studio executives, the Henies rented the Polar Palace in Los Angeles and funded two heavily advertised performances to showcase Sonja’s talents. The ploy worked, and soon Henie was offered a five-year contract with Twentieth Century-Fox. Between 1936 and 1939, Henie appeared in six highly popular light romances with plots contrived to include show-stopping skating sequences. Although her skating was the most notable feature of these films, Henie took her new role as an actress seriously. On the set, she was an avid student of filmmaking and worked hard to learn to act credibly. Audiences responded by making her the third top box-office draw of 1939, falling behind only Clark Gable and SHIRLEY TEMPLE. Taking advantage of her film success, Henie staged the sold-out “Hollywood Ice Revue” in 1937. She also coproduced an ice show that ran in New York City for 10 years. An astute businessperson, Henie handled many of the details of managing the show herself, from making bookings to hiring and firing the staff. 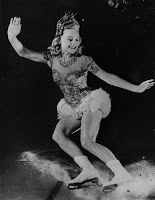 In the early 1940s, the novelty of Henie’s skating films faded, leading to her retirement in 1948. The war years and their aftermath were also fraught with controversy for Henie, as many Norwegians accused her of providing little financial support for her countrypeople as they suffered under Nazi occupation. Their anger was fueled by rumors of Henie’s sympathy for the Nazi regime dating from her participation in the 1932 Olympics in Germany. Henie married Daniel Topping, the owner of the Brooklyn Dodgers, and Winthrop Gardner Jr. a wealthy New Yorker, but both unions ended in divorce. In 1956, she wed a third time to Norwegian businessman and art collector Niels Onstad. With his encouragement, she invested much of her multi million-dollar fortune in impressionist art. In 1968, they placed their collection in the Sonja Henie-Niels Onstad Art Center in Oslo as a gift to the Norwegian people. Eighteen months later, Henie succumbed to leukemia on October 12, 1969. Henie, Sonja. Wings on My Feet. New York: Prentice-Hall, 1940. Strait, Raymond, and Leif Henie. Queen of Ice, Queen of Shadows: The Unsuspected Life of Sonja Henie. New York: Stein and Day, 1985. Wakefield, Wanda Ellen. “Henie, Sonja.” In American National Biography, edited by John Arthur Garraty and Mark C. Carnes, vol. 10, pp. 590–591. New York: Oxford University Press, 1999. 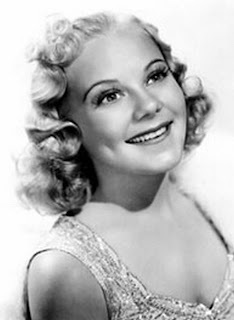 Biography: Sonja Henie (1998). A&E Entertainment, VHS, 1998. One in a Million (1937). Twentieth Century-Fox, VHS, 1994. Sun Valley Serenade (1941). Twentieth Century-Fox, VHS, 1991.